I wish that I could walk through the air in Lordran! I am still trying to understand how the Dark Souls map fits together. This is my second play-through of Dark Souls 1. When I say “play-through” I mean that last year I got as far as ringing the second bell and coming face to face with Frampt. This is about one-tenth of the entire game, but it’s a really nice stopping point. The only way I was able to get even THAT far was with the assistance of my son and two of his friends. This year I am trying a different “character build” (emphasizing different traits as my character gains in strength and skill). I’m also trying to do more on my own. Another difference this time around is that I have software that records game footage, so I hope to make some videos soon! I really enjoy playing this game, though I probably play it differently than a lot of people. Tonight I spent about 20 min. working on my parrying skills. I hung out at the second bonfire, the one in Undead Burg, and just kept battling the same opponents over and over. Since there was very little risk involved — I could easily pick up the souls (points) I dropped when I got killed — I was free to try out some new combat techniques. I can parry successfully maybe one time out of 5. I am also practicing switching back and forth between the shield and the staff in my left hand, and the spear and the bow in my right hand. My goal is for it to be second nature. I did have an encounter this evening where I felled opponent #1 with an arrow but accidentally caught the attention of opponent #2. By the time I saw him he was just a few feet away. In my panic I forgot how to switch hands and so was whacking him over the head with my bow while still peering through the “binoculars”. The game admonished me “YOU DIED” and I said “I know, I know“. Tonight I also practiced the most recent bit of new territory — from the second bonfire, up the ladder, to the walkway under the Dragon Bridge. First there are some poisonous rats, then there are knights that are more powerful than my familiar ones in Undead Burg, and some pesky archers. This time I got past the upper and lower archers and took the steps downward through a twisty hallway into what looked like a lunch area. I found a “mystery key”. I carefully, carefully walked across a beam and picked up a bit of treasure. Then I climbed another ladder and found a hallway blocked by a misty white wall. I left that progress point for another time. I wanted to see what door was opened by the mystery key. There were three possibilities I knew of. As I ran around from locked door to locked door, I climbed high towers to see where I had been. In this game if you drop an item that you don’t want to carry, it hovers in the air, a glowing essence. I left a large pile of broken swords and cracked shields on the Dragon Bridge Walkway and then looked back to see where it was. The towers, walkways, and paths weave under and over each other, twisting back on themselves. I have a hard time picturing where things are in relation to each other, and so I really enjoyed looking for my glowing marker from many different locations. I think I must have spent half an hour just walking through the empty streets, towers, rooms and stairways. They were eerily silent (because I had already cleared out the opponents). Even after about 120 hours in the world of Dark Souls, I still love wandering down the mossy cobblestone walkways past ivy-covered stone walls. I can almost smell the chill, humid air, the earthy scent of aged and rotting timbers, the smoke of the bonfires. I decided to make my way home all the way to the first bonfire, Firelink Shrine. The undead soldiers in that area had regenerated and so I had to fight my way through them in reverse order. I tried some new approaches — for example shooting some with a bow from way up on a roof. This is a challenge because if you stand in the wrong spot your arrows bounce off the stone walls, and if you move carelessly you fall off the roof! James (of Extra Credits fame) refers to this as “ranged combat” and considers it a kind of Dark Souls easy mode. It is easy in the sense that once you have been through a new area and died a few times, you know which opponents to pick off from a distance and which to fight up close. I especially like using an arrow to “pull” one opponent away from a group so that I can deal with them one at a time. In this video, Dan battles a sort of metal-armored rhinoceros-pig. I have already vanquished this creature. I did this by darting in and out of the pillars and blasting him with magic over and over again. It was a little sad to see him go: he was a magnificent creature. I am particularly pleased with “Farewell to Nagu” because this is the first time I have done any singing on my own music compositions. I wrote harmony, sang all the harmony parts, and recorded each part 5 or 6 times. Then I blended them together and used lots and lots of reverb. To me it sounds like an alien angel choir! The Noelgervay songs were based on the music that was playing in-game while I was recording video. For the second, slower version I simply played along with the in-game music. For the first, faster version I took the same melody and chords, modified them, and picked up the tempo. This is a silly episode where I assembled video segments that were left over. I especially enjoy the times when the graphics phenomenon called “clipping” caused entities to pop into my ship. The first time this happened I really did let out a yelp. What a great jumpscare! After that it just made me laugh hysterically. I think it’s great that bugs in a game can have unintended entertainment value. 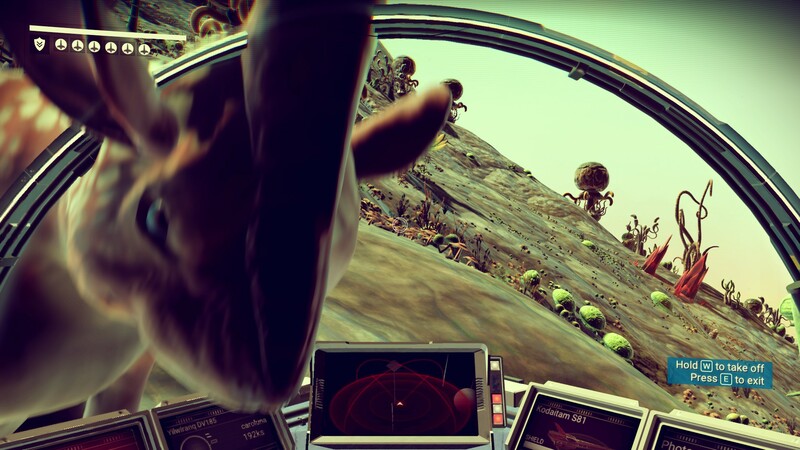 This episode is especially poignant now that No Man’s Sky had the August 2017 update. Although the game now has more depth and complexity, the universe was “re-written”. A few planets are as before, some are the same but have lost their names, and some have lost both their names and their distinctive traits. “Dawnseas” no longer has seas, and “Summerhome” is no longer the sort of place you would want to spend the summer. 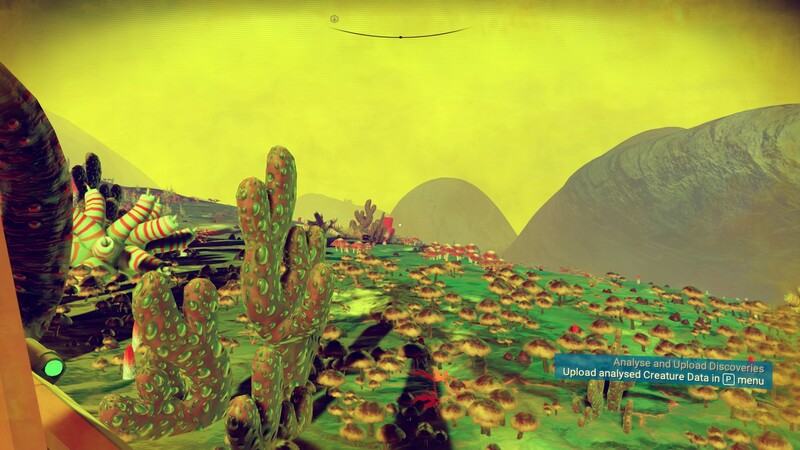 Worst of all, my home planet Neochadwickia has turned into a charred cinder. It’s as if the planet moved to an orbit closer to the sun. Whenever I returned from an adventure, I would hop up onto the roof of my base and look out on the landscape near my home. I can see in my mind’s eye the sunset colors, the silvery-green grass, and the strange craggy hill that looked down into the southern valley. 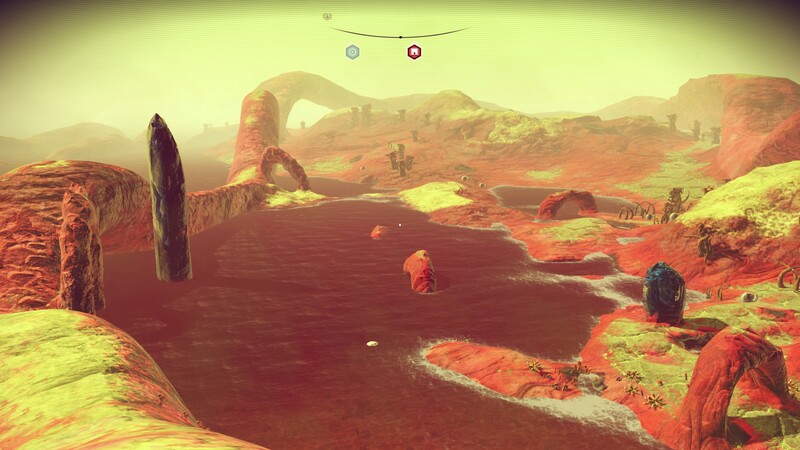 I have to admit, when I came back to No Man’s Sky and saw that my home planet was irrevocably changed, I cried for a few minutes. I’m very glad that I had taken lots of photos and videos. Maybe this loss affected me so much because it’s a difficult time. My parents are in their 80s and my father especially is in precarious health. The loss of Neochadwicka is just one more reminder that nothing / no one is forever — and a reminder that I can take the time to engrave these memories on my heart and mind. I love the time lapse intro! When I made the soundtrack for this, I was delighted how the synth sounded so much like something by Enya. I’ve been wanting to make videos for Youtube for ages! The computer I have now is fast enough to run No Man’s Sky while ALSO running the screen-capture software. 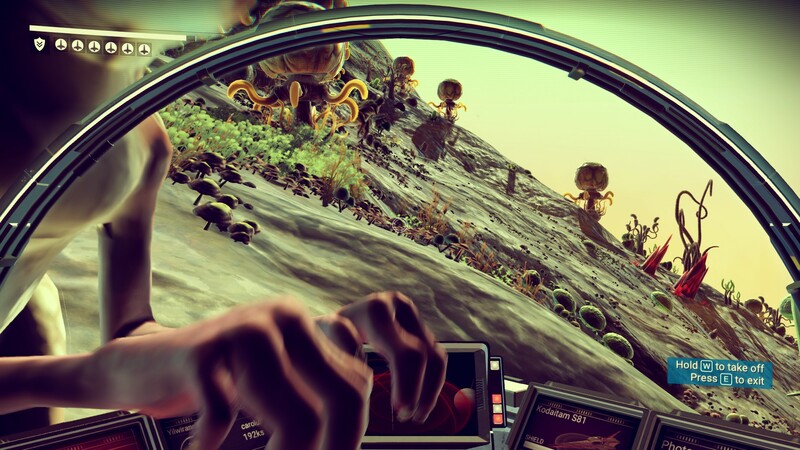 (My previous computer can’t even run No Man’s Sky). The video editing software I’m using is called Movavi. I have been working on these videos for several weeks and I keep learning new things about the software. Yesterday I figured out how to add a “freeze-frame” (stop the film and hold it on one picture) without making a big gap in the background music. Here is video # 3. (I’m redo-ing videos 1 and 2. ) I still need to fix the soundtrack. The sound effects coming from the game footage are in stereo (comes through both ears of your headphones) but the music I composed is only coming through one ear. I didn’t notice this flaw when I uploaded the video (because it wasn’t as obvious when using speakers). Thanks K for pointing this out! There is a phenomenon that can happen in computer games called “clipping”. It’s when one object seems to project right through another instead of being stopped. 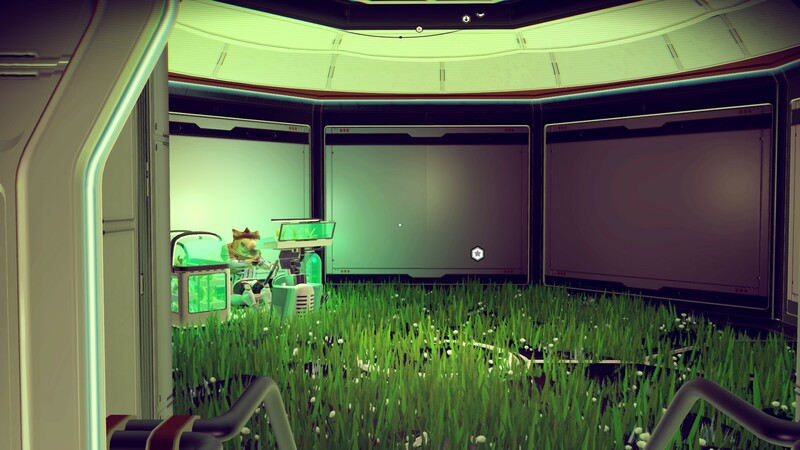 Here is a case where the grass under my planetary base is clipping right through the floor. Since the little guy in the corner is my agricultural team leader, it seems extra appropriate. Maybe he likes having grass growing in his laboratory.